UK Official Services provides replacement British Birth certificates registered anywhere in the UK and events registered overseas with the British authorities. Order a birth certificate for any birth registered in the UK between the years 1837 and 2014. Order a marriage certificate for any marriage registered in the UK between 1837 and 2012. Order a death certificate for any death registered in the UK between the years 1837 and 2014. Order a divorce certificate for any divorce certificates registered in the UK between 1940 and 2015. Order an adoption certificate for any adoption registered in the UK between the years 1927 and 2014. Order an overseas certificate for any British birth registered outside the UK between the years 1920 and 2014. Order an apostille stamp to legalise your UK certificate for use abroad. 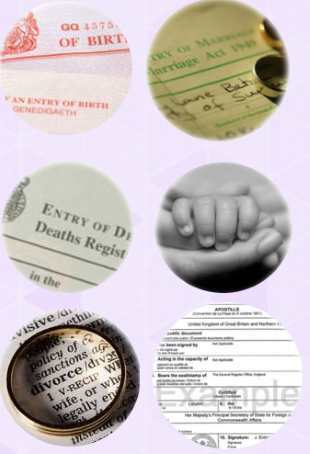 We provide replacement Birth, Death, Marriage or Divorce certificates registered anywhere in the UK. The fee for a replacement certificate start from £13.99 plus postage. All certificates provided are suitable for all legal and family history purposes and are dispatched after 8 working days by 1st class post. Overseas orders are dispatched by airmail. Postage costs start from £1.99 for UK and overseas delivery. Replacement Certificates may be required due to the original certificate being lost or misplaced, or by those interested in genealogy. The certificates provided can be used for constructing family trees, or for any official purpose including applying for Passports, Driving Licence, Employment, Social Security, Visa, Banking & Insurance, School or University. Alternatively, you can order a UK Birth Certificate by calling our office. Payment can be made via our secure online system using debit or credit card.